Cancellation 15 days before arrival will incur charge of 1st night of booking for all guests. Cancellation 7 days or less before arrival will incur charge of 1st night booking or 50% of total booking whichever is greater. If you are looking for the best value Party Hostel, Fun Wan is the place. Our common space is over 80 SQM with a Full Bar and enough seating for all registered guests and their friends. We have Nightly Dinner and Drinking Specials as well as Party Games. We designed the common area and nightly activities to enhance our guest’s interaction to provide them with epic nights, every night. Fun Wan Hostel has been welcoming guests since April 2016 and recently completed a large renovation project of the common space in April 2018. We have operated and managed the property with the guest’s comfort, convenience, enjoyment and wallet in mind. If you are looking for a clean, comfortable and affordable hostel that keeps the good times rolling then you have found it. At Fun Wan Hostel we want you to meet and party with other like-minded individuals while having the most comfortable place to rest your head after a day of exploring the city and a long night partying. 1. Check-in Time: from 1pm. - 200 Baht cash security deposit will be required at check in. 2. Check-out Time: until 11am. - Any damaged or lost hostel property (linens/keys) will incur fees at check out. 4. Cancellation Policy: Up to 3 days advance notice before the arrival date is required. Please contact hostel directly. 5. 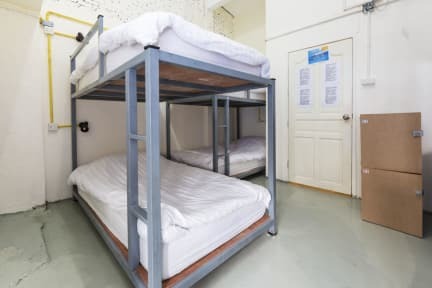 Age Restriction: The minimum age to stay in the hostel is 16 years old. great location a 5min walk from the sky train, great food for cheap and even better service. Yo, the mail receptionist, is the sole reason I enjoy traveling through Bangkok. This guy is the best hostel worker I’ve ever met! Buddy even tattoo’s and it’s phenominal work! 100% recomendó his services. Also, hostel is very clean, and did I mention the home cooked food? Excellent overall hostel. It deserves a 12 out of 10. Great location in the middle of lots of great bars and clubs for fun nights out after drinking cheap buckets at the hostel with other guests. Best security, with two security doors, one to enter building and other to get to stair case for rooms which is really important since they have a full bar that is open to non-guests. Everything is much better than expected. Everything about this place was exceptional, especially for the price. You can't find a better place for a price like this. Only downside was bathrooms are one per room and sometimes I had to wait to use the one in my room. Luckily I found out there are others in the hallway downstairs. Highly recommend for people who want to party, meet others and have a great nights rest. Beds are super super comfortable. Good stay! Staff was very very friendly and accommodating. Location is good but it depends what you came to Bangkok for and where you plan to head to. There's a BTS station nearby and a boat pier (which was quite a walk away) so at least you have options. Lots of eating options nearby plus the hostel serves its own food. Aircon was a bit warm at night but definitely one of the most comfortable beds as far as hostel bunk beds go. 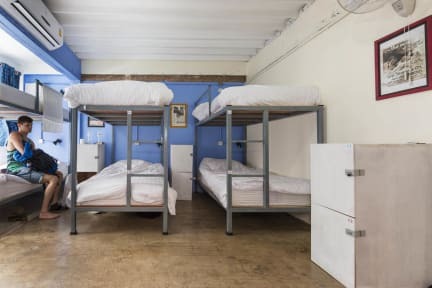 Cheap hostel, great location. Definitely not a party hostel but they serve food, have games downstairs and friendly staff for the most part. That being said - it’s definitely a super strange mix of people. When I stayed, it was half old men (70-80 years old) and half young travelers. I met some great people but it was uncomfortable to be constantly hit on by older men clearly looking for something. WiFi is absolutely terrible, when I asked someone to reset the router she said no. Fine stay. Overall good, although a little strict on the rules.